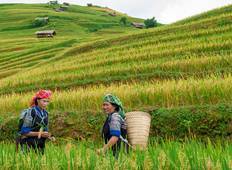 There's no better way to explore Vietnam than on foot, and the northern region offers some particularly magnificent hiking and trekking opportunities. Start in Hanoi and travel to Sapa, a hiking base known for its postcard-worthy terraced fields and colourful hill tribes. "Our family of 6 spent 5 N 6 D in Hanoi, visiting Hnaoi city, Halong Bay and Sapa...."
"Everything was well organized and planned out. I just had a few detailed things that..."